If you have school-age children, you know it’s not just Halloween goblins that go haunting this time of year. At kitchen tables and bedroom desks across the country, the Homework Apocalypse is going on like a B-grade horror movie. The bargaining, the crying, the never-ending whining. And that’s just the parents. Otherwise lovable children can morph into monsters at homework time. Perhaps you’ve met some of them – the Time-Wasting Tornado, the Seat Shifter, The Perfection Piranha. Maybe you’re more familiar with the Defeated Dragon or the Great Pretender. All five homework monsters have appeared in our kitchen, gobbling up free time and turning evenings into a battleground. But they’re not invincible. 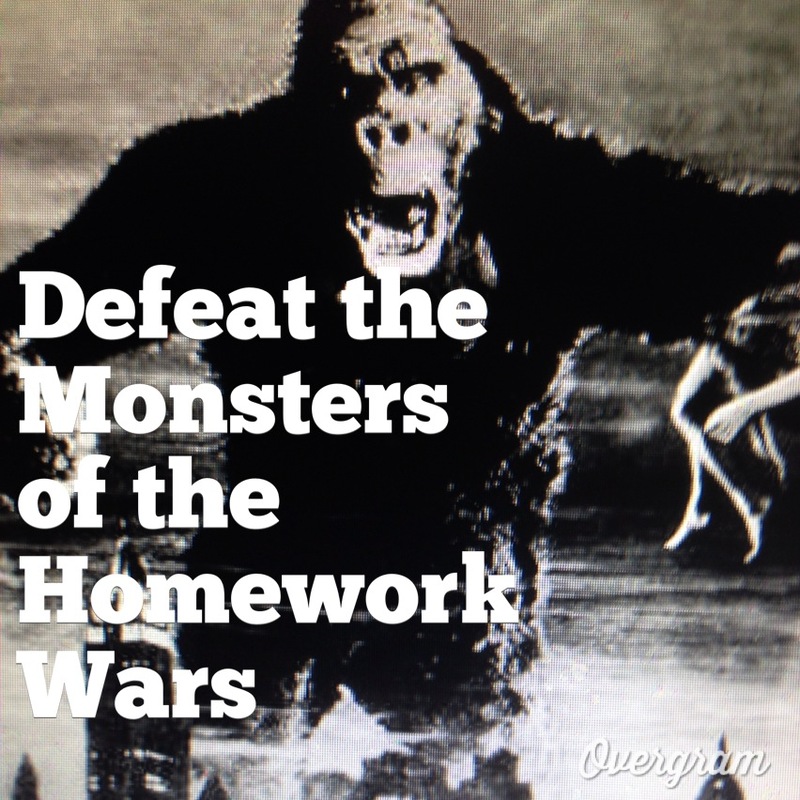 A few battle tactics can have you banishing the monsters and winning the homework wars. The Time-Eating Tornado never met an excuse he couldn’t use to postpone the start of actually working on those assignments. Dull pencil, uncomfortable chair, hunger pains, unquenchable thirst… you name it, it can be used to stretch a 15-minute assignment into an hour. But you can cut this homework monster off at the knees with a well-equipped homework bunker. Before school even gets started, set up a homework zone stocked with any supplies your child might need: pencils, sharpener, paper, pens. Sunday afternoons, take a few minutes to restock and make sure you are ready for the week ahead. If you have a master procrastinator, you’ll need to move beyond the basics. At our house, it never fails that as soon as my son sits down, he will suddenly be hungry. It does not matter if he has just polished off a large pizza, a foot-long sandwich, and a side of beef! Homework elicits new pangs of starvation. So at our house, the homework zone is stocked with a healthy snack basket and has bottled water on hand. But you don’t need a seat belt or duct tape to get the wiggler under control and on task. Instead, think about ditching the chair altogether and have them do their homework sitting on a balance ball. A Mayo Clinic study in 2007 showed kids with attention-span challenges who used the balance balls had better focus and more productivity. You can also create a “brain break” jar for the homework zone. On popsicle sticks, write activities like “do 10 jumping jacks” or “dance party,” and when the Seat Shifter starts wiggling, have them draw a stick and get moving for a minute. It can also help to make sure homework time doesn’t start until after your child has had some time for active play. High standards are important, but some children are so worried about getting their homework exactly right that they just don’t get going for fear of getting something wrong. Or, they constantly re-start projects that don’t meet their standards. As a kindergartener, my daughter worked for hours one evening decorating a letter “M” that represented her first name. But after we’d glue-gunned, glittered and bedazzled every inch of the letter, she suddenly decided something was not quite right. Before I could grab it, the “M” was crumpled into a ball of defeat and tossed into the trash. You can quiet the Perfection Piranha by setting limits on homework time when done means done. Make sure you are praising the work your child puts in, not just the grade he or she gets, and model gracious mistake-making so your child learns to deal with defeat. For children who struggle in school, homework time can feel like an extended jail sentence. Before they ever pick up a pencil, they feel defeated. The homework looks too hard, too long, and too overwhelming. To give the Defeated Dragon back his fire, divide and conquer. If your child is overwhelmed at the idea of a 30-question practice worksheet, don’t be afraid to get out your scissors and actually cut the worksheet into smaller sections, and give them to your child a few questions at a time. You can tape it back together before it’s turned in. Celebrate these “mini-victories” with homework breaks, and applaud effort, not just right answers. The Great Pretender can appear to be the model student. As soon as he or she gets home from school, they head right to their room and sit down at their desk with books and notebooks out, laptop fired up to tackle their latest assignment. Three hours later, they have nothing to show for their hard work – unless you count five Facebook updates, three selfies posted to Instagram, 12 text messages to friends and a notebook full of anime sketches as academic progress. To unmask the pretender, let them choose between two strategies. Either set up a homework zone where you can monitor their progress. Or, if you want to respect their choice to work alone in their room, set a kitchen timer with check-ins every 15-20 minutes so you can know they are mixing in a fair amount of work with the play. No matter which monster shows up at your house during homework time, a little preplanning, consistency with expectations, and a positive outlook can help you send them packing for good, and bring back a peaceful co-existence to homework time. Not only am I bookmarking this, I’m printing it out, framing it and keeping it FOREVER. I think you just saved my life. I love this! I have a little seat shifter on my hands! I think I have all 5! And only 2 kids.